This is a part of a set of salvaged seats from an early model variant of the Opel Manta A series. This style of seat has a much more sporty appearance than those found on the later cars. The vinyl has small ventilation holes in the centre sections and the leatherette has a very delicate grain pattern. The overall look is much more in the minimalist 60s muscle car theme, rather than the 70s saloon comfort theme. In the past I have covered many thousands of miles in this type of seat and found them to be very comfortable. Just don't jump in on a hot summers day wearing shorts or you'll need to visit casualty for third degree burns treatment. These seats suitable were the standard fitment for many variants of the Opel Manta A series, including the Rallye, SR, and Deluxe models. In my experience, this style of seat is normally seen (in the UK) on those variants made during the 1970-73 period. The chassis number for such vehicles would usually begin with a 592 or 599 prefix and would correspond to; J, K, L and even M suffix registration plates. This is the passenger's seat (UK RHD) from the set, it is in quite good condition. There are a few wear marks here and there on the vinyl, on the exposed edges there are some spots that have worn through although they are rather small. It could be really useful for anyone with a left hand drive vehicle as a drop in replacement for a tired seat on a daily driver. This early model Opel Manta passenger seat is available for £30; delivery is possible within the UK. but will be expensive due to size and weight, it might also be possible to send multiple items via pallet. Alternatively I can arrange for a rendezvous around the Midlands area for cost only. Likewise I could meet continental enthusiasts in the region around Calais or Dunkirk, but please ask for a quote first as this could be quite expensive to do. This is the rear seat back, sadly it was ruined by the sun whilst parked up. The top section has completely disintegrated and will require professional restoration. It might be worth salvaging what's left to make repairs on other seats. I can even remove the material and post out for cost if this is your intention. This early model Opel Manta rear seat is available completely free; delivery is possible within the UK. but will be expensive due to size and weight, it might also be possible to send multiple items via pallet. Alternatively I can arrange for a rendezvous around the Midlands area for cost only. Likewise I could meet continental enthusiasts in the region around Calais or Dunkirk, but please ask for a quote first as this could be quite expensive to do. This is the rear seat squab and is in nice condition. perhaps whoever owned the car didn't have any kids. It should be noted that the black casement type material fitted around the sides of the seat is crumbling. This material is not seen once the seat is installed, but it does serve to hold everything together and in my opinion you will struggle to re-fit the seat without it tearing much worse than it already is. This early model Opel Manta rear seat squab is available for £30; delivery is possible within the UK. but will be expensive due to size and weight, it might also be possible to send multiple items via pallet. Alternatively I can arrange for a rendezvous around the Midlands area for cost only. Likewise I could meet continental enthusiasts in the region around Calais or Dunkirk, but please ask for a quote first as this could be quite expensive to do. This is a part of a set of salvaged seats from a very late model variant of the Opel Manta A series. This style of seat is more substantial than those found on the earlier cars; the material has larger ventilation holes with a more pronounced grain to the leatherette. Some people like this style of seat for their support and comfort, whilst others hate them for not looking "sporty" enough. Regardless of aesthetics if you are an originality freak you will want these rare seats suitable for later models of the Opel Manta A series, including the SR, Luxus and Deluxe models. In my experience, this style of seat is generally only seen (in the UK) on those variants made during the 1974-75 period. The chassis number for such vehicles would usually begin with a 598 or 595 prefix and would correspond to; M, N and even P or R suffix registration plates. The seat back has the obligatory sunlight crack; in this case it was not very well hidden under a piece of Gaffa tape. The patch has long departed and only its ghostly glue residue remains. The squab though is in very nice condition. I would guess that whoever owned the car didn't have any kids. This late model Manta seat is available for £30; delivery is possible within the UK. but will be expensive due to size and weight, it might also be possible to send multiple items via pallet. Alternatively I can arrange for a rendezvous around the Midlands area for cost only. Likewise I could meet continental enthusiasts in the region around Calais or Dunkirk, but please ask for a quote first as this could be quite expensive to do. 27/10/18 - Offer made, awaiting payment. This is the passenger's seat (UK RHD) from the set, it is generally in quite good condition. The end of the seat back release lever is missing and there's a tiny bit of foam showing by the recliner knob. It could be really useful for anyone with a left hand drive vehicle as a drop in replacement for a tired seat on a daily driver. I suspect the headrests are non-genuine, they're covered with a slightly smoother pattern of black leatherette, they are a very tight fit and there's no collar present around the mounting points. This late model Manta seat is available for £20; delivery is possible within the UK. but will be expensive due to size and weight, it might also be possible to send multiple items via pallet. Alternatively I can arrange for a rendezvous around the Midlands area for cost only. Likewise I could meet continental enthusiasts in the region around Calais or Dunkirk, but please ask for a quote first as this could be quite expensive to do. This is the driver's seat (UK RHD) from the set, as can be seen from the images it is in poor condition. The seat base is cracked and split in multiple places and the bolster has worn right through to the horse hair. I suspect this came from a keen driver's car! It is sold with the intention that it will be for restoration purposes, this is reflected in the low asking price. On offer is a pair of new old stock Opel front mud flaps for the Opel Manta A series. They are made from a black coloured rubber and with no Blitz emblems or other embellishments. The packaging has been opened at some time, but the mounting clamps and full mounting instructions are still included. The part number on the label is 17 18 513. This is a pair of window winder handles for the Opel Manta & Ascona A series. They are used Opel parts with the part number 8959158. They both have good glossy chrome, but with some light scratches and “pimples” showing through; there is some wear and tear to the black plastic knobs. This is a distributor arm for a variety of Opel models. 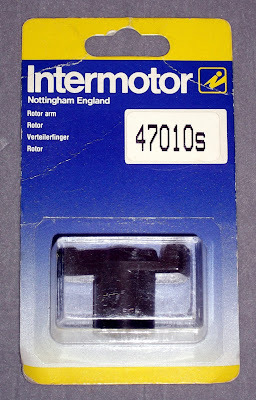 It is a new old stock part made by Intermotor with the part number 47010s. But given the widespread sharing of parts between so many Vauxhall and Opel models it could be suitable for a variety of additional models. It is priced at £7.50, the price includes delivery within the UK. I can send to some European locations too, but please ask for a quote first as this could be quite a high sum.